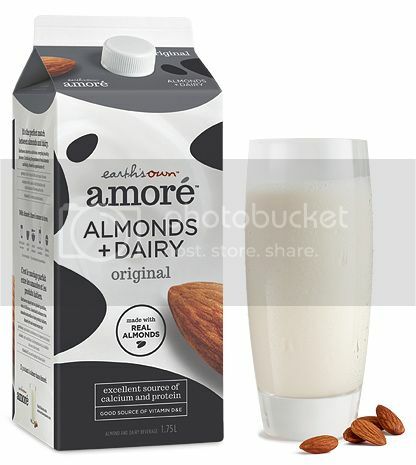 I have recently been asked to review Amoré Almond + Dairy Beverage. I do not like the taste of milk so I do not drink it often unless we have some chocolate syrup to add to it so I was excited to try this. I received 2 Free product coupons and I couldn't wait to go to the store and get my products. Anyways, right after we got home with the groceries and after it was all put away I was thirsty so I grabbed the Amoré Almond + Dairy Beverage and got myself a glass. WOW!! I absolutely love it. It is so delicious. The almond taste isn't overpowering at all and for the first time in a long time it didn't take me long to drink a full glass. This morning I tried the Original one and I love it as well. I also love it in coffee. It gives it more flavour than regular milk does. I can't wait to try it in smoothies and in my Christmas baking next month. I know I will be buying this again and again in the future. Oh I forgot to add that it has 50% more calcium than regular milk.